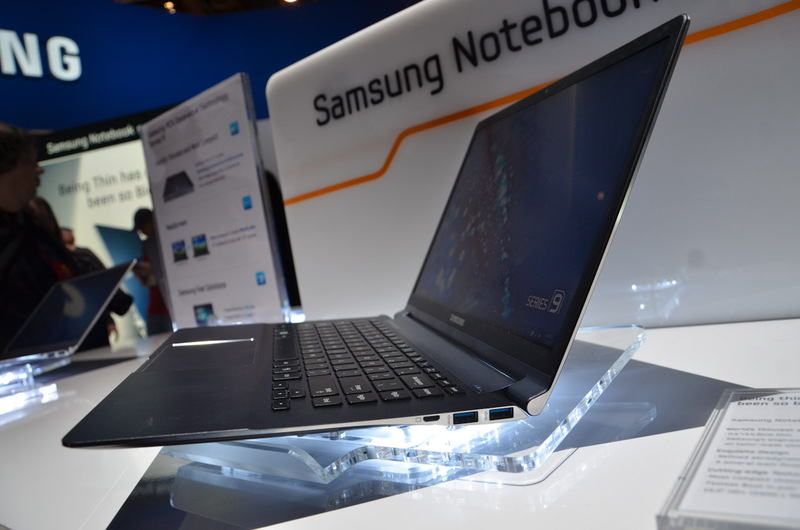 Samsung showed off a completely new line of notebooks at CES, and we've gotten to go hands on with all of them. In addition to the refreshed Series 9 ultraportable that we saw earlier, Samsung was showing off the new Series 5 and Series 5 Ultra, the Series 7 Chronos, and the Series 7 Gamer. The new Series 9 comes in 13" and 15" variants, compared to 11" and 13" variants for the original S9. With the S9 refresh, Samsung basically fixed every design related complaint leveled at the S9 and then slimmed the entire system down for good measure. The glossy plastic on the LCD bezel and interior of the notebook is gone, as are the hidden drop-down ports, and the gorgeous matte display panel gets a much needed bump in resolution to 1600x900. Samsung claims a 400nit brightness for both generations of the Series 9, and we measured the original at 394 nits max brightness and a 520:1 contrast ratio. The new one looks to be similarly great - if every notebook had a panel like this, we would never complain about notebook displays again. Samsung has moved the S9 over to an anodized aluminum unibody chassis (sound familiar?) allowing them to cut the weight of the 13" model to 2.5lbs (from 2.8) and reduce thickness to an anorexic half-inch. The slow selling 11"er has been dropped from the lineup, replaced by a larger 15" model. I use the term larger very loosely, as the 15"er weighs just 3.3 pounds and strikes a footprint smaller and thinner than most of the new 14" ultrabooks on display at the show. The Series 9 is slated to show up in Q2 for $1399 and 1499 price points for the 13" and 15" models, respectively, and will be sold alongside the original Series 9 systems until Q3. Staying with the ultraportable theme, Samsung also launched the Series 5 Ultra, a mainstream ultrabook featuring 13" and 14" models. Samsung is speccing these with the standard ultrabook fare - low voltage Core i5 processors, 4GB of memory, a 500GB hard drive with 16GB express cache, optional SSDs, and 8 hours of battery life. The express cache drive is borrowed from the Series 7 Chronos, a feature that Anand will go more in depth on in a later post. 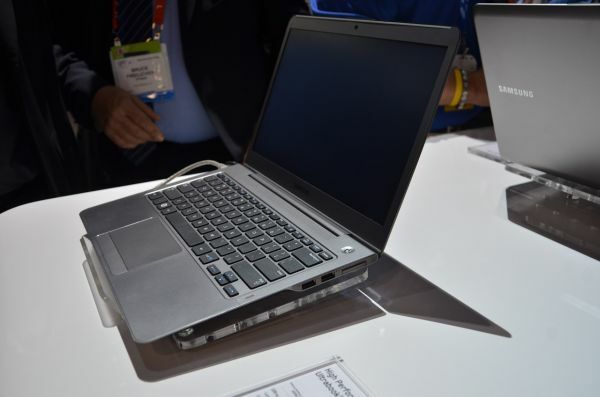 The 14" S5 Ultra is notable for having a built-in optical drive, a rarity in the ultrabook class. Both the 13" and 14" models have matte, 300 nit 768p displays, and it's really nice to see Samsung pushing for good quality displays throughout its notebook lineup. The S5 Ultras are both relatively heavy, at 3.5lbs for the 13" and 3.95lbs for the 14". They're not heavy by normal standards, but compared to many of the other ultrabooks on display, they're definitely not light. The S5 Ultra will start at $899 for the 13"er and $949 for the 14", while the SSD option will cost you $200 on the 13" model. Both models will be available on January 30th. The mainstream Series 5 notebook looks to be a very solid mid-range option that is set to ship when Ivy Bridge launches later this year. 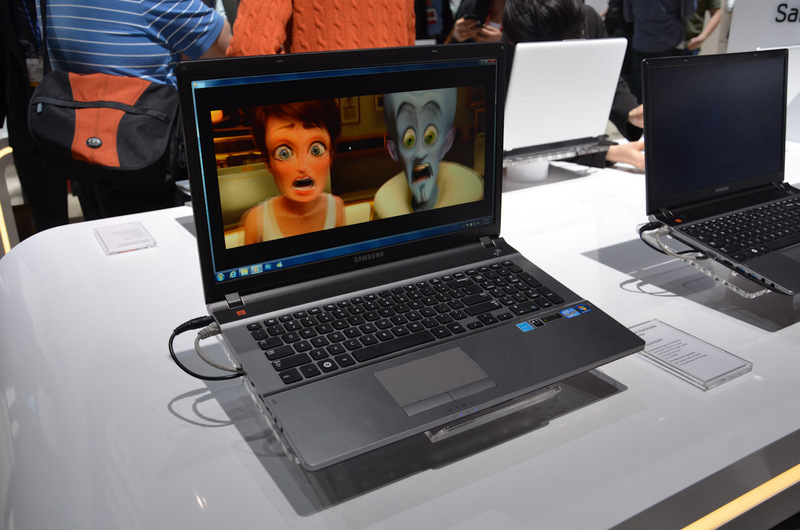 There are two models, a 15.6" (900p) and a 17.3" (1080p), both with matte 300-nit displays. Starting price is expected to be in the $799 range for the 15.6" model, and the spec list includes Ivy Bridge i5/i7 CPUs, Nvidia's GT650M with Optimus, up to 2TB of storage in the 17", Blu-ray, and JBL speakers. For a mid-range media oriented system, it looks to be very full featured and well specced, and given the quality of the display, the Series 5 is definitely a notebook to look out for in the second half of this year. The Series 7 Chronos is a notebook that's been out since late last year in 14" and 15.6" forms, and Samsung snuck in a 17" variant at CES. The 17"er comes with a 1080p matte display with a 300nit brightness, along with IVB Core i7 quad-core CPUs, next-gen ATI graphics, JBL speakers, and the same express cache technology as the smaller S7 Chronos systems and the S5 Ultra. Pricing is expected to be in the $1500 range, and availability is slated for the Q2-Q3 timeframe. The Series 7 Gamer is the largest and most ostentation system that Samsung was showing off, in a variety of bright and loud colors. It's available in your choice of bright yellow, orange, and red, as well as a (slightly) more understated black. Spec-wise, it's pushing an i7 quad, AMD's HD6970M with 2GB of vRAM, JBL speakers, and the same 1080p panel as the 17" S7 Chronos. The keyboard has blue backlighting, except for the WASD keys, which are highlighted in red. 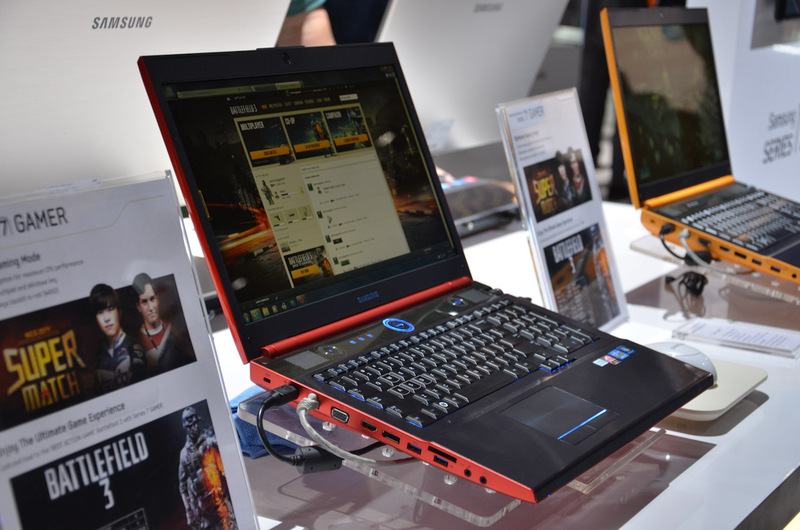 The system is gargantuan in size, rivaling things like the ASUS G74 and Toshiba's Qosmio X770. It's expected to show up in Q2 for $1799, hitting the higher end of the gaming notebook market. Overall, Samsung seems to be making a huge push in the notebook market, and in a very short time, has become a serious player in the mobile PC space (or at least the American market, since Samsung has been pretty big in Europe and Asia for quite some time now.) We're pretty eager to get some extended time with their new notebooks and excited to see where Samsung goes from here. What other laptops ship with matte screens? Really want to upgrade my 4yo lappy and these machines are drool worthy. I hope that when you guys get a unit to review that the kb/tp matches the quality of the screen. If so, this will be on my short list to look at. I guess 13" is small enough for most people, not to mention you often compromise specs and performance once you look at <13" models.